One of the great things about having a single system where students and educators can find experiential learning activities (CBLEs) is the efficiency with which connections can be made with employers. Currently, nearly 600 businesses and organizations are offering a combined 3,000+ CBLEs to the students and educators across our region through Inspire. We hope that educators will take full advantage of these offerings and continue to empower their students to do so as well. Information on how to best use the system is key. So we’ve put together a brief tutorial on how to find CBLEs, make requests, follow up on requests made by students and record requests. First, let’s look at how to find and make requests as an educator. First, log in to your Career Cruising CAMS account and click on “Inspire Madison Region” then click on “Search for CBLE” (see Figure A). Next, decide whether you want to search by industry or by CBLE type and then choose which industry or CBLE type you are looking for. Once you are on the results page for your selection you can filter the results by city (see Figure B). After you find an CBLE that interests you, submit a request by clicking on the name of the request listed (left column in Figure B: job shadow, internship etc.) and filling out the details, or you can click on the name of the company listed to get their contact information (3rd column from left in Figure B). It is up to you if you make a request directly through Career Cruising, use the contact information provided to call or email the provider, or use a combination of both. But if you choose to only call or email a provider to request an CBLE that you found in Career Cruising, it’s important to record that CBLE by clicking on “Manage CBLE Requests” then “Record a Request”. That way, the “who, what, when, where and why” of the CBLE will be recorded in the system. The screenshot below (Figure C) shows where to click to record a request that was set up outside of Career Cruising. Next, we’ll look at how our suggested process for managing CBLE requests generated by students. Review the request from the student and make sure he or she is prepared for the activity. At this point, the provider has not received the request. You are in the role of gatekeeper and the request will only proceed to the provider if you approve it. Decide if you or the student will make the initial contact with the CBLE provider. If the student will make the contact, give the student the provider’s contact information (See #1 on Figure D). Once the student and the provider have agreed on a date and time, navigate to the request in Career Cruising, enter the date, time and any details under “Selection Options” and click “Confirm and Finalize” (See #2 on Figure D). Once you’ve done that, the activity has been finalized and recorded in the student’s portfolio. To use the Career Cruising system to send a student’s request to the provider, enter the suggested date, time and details into the fields under “Selection Options” in the request and then click “Check with Volunteer” (See #2 on Figure D). This sends the request to the provider and means you approve the student to participate. The provider can then accept the reqeust, suggest another date and time or decline the request. We recommend contacting the CBLE provider directly if they haven’t responded within a week. Note: unlike when a student initiates a request through Career Cruising, it is up to the provider to click on “Confirm and Finalize” in their employer account when an educator initiates a request through Career Cruising. Sometimes you may wish to contact a provider yourself instead of having the student do it but would like to use email or phone rather than Career Cruising. If that’s the case, once you and the CBLE provider have agreed on date and time, enter that information under “Selection Options” in the request and click “Confirm and Finalize” (See #2 on Figure D). That will record the CBLE in the system. 1. Add more of your careers to your company/program profile. The more careers your company is associated with in Career Cruising, the more easy it will be for them to find your company. 2. Add video to your company profile if you have any. Career Cruising allows up to six videos per profile. To do this, you’ll need to upload video files (MP4 format) that are 100 MB or less. 3. Add high-quality, useful content about your company to your profile with language geared towards young people who are considering career paths. Generic information is okay, but if you customize it for the audience, it will be more impactful. Why should someone consider working in your industry or at your company? What types of opportunities does your company offer? What types of degrees, certifications and skills (technical and soft skills) do you look for in job candidates? What are your high-demand jobs? What are the perks of working at your business? 4. Send targeted messages to distinct groups of students who have indicated interest in career areas in which your company employs people. To do this log-in to your company profile, click on “connect with students”, then “send message” and then select “advanced filtering options”. Choose from the options by narrowing the targeted audience by school, county, grade, careers, career clusters, and if they’re interested in your company. Student-bound messages to students should be meaningful in rCBLEtion to academics and careers. You can send things like invitations to visit you at a career fair, scholarship opportunities, information about your industry, and even job opportunities your company offers to young people either while in high school or after graduation. 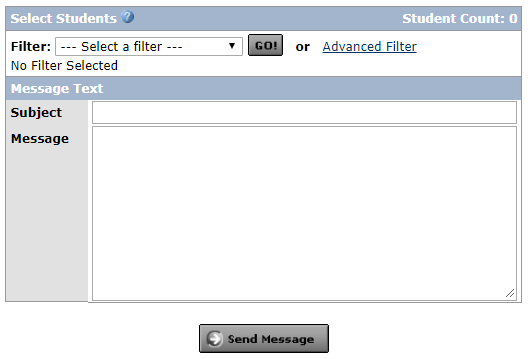 Check to make sure each message is to 1,000 or fewer students then send. Inspire management will review your message before releasing it to students. See here for screenshot of how to do this. 5. Recruit career coaches from your company in key career areas. Career coaches can not only answer questions from students about specific careers and industries, but they can also point students back to your company profile to learn more. 6. Add a company message board to your profile if you haven’t already. Distinct from career message boards, a company message board is where career coaches can answer questions specifically about your business. This adds another way to connect with students who are interested in your industry and increase student saves. 7. Offer experiential learning activities to your company profile. This will also increase the chances that you’ll interact with interested students and educators and build your future talent network. By increasing your visibility this way, you will also increase the number of students saving your company to their portfolio. 8. Get more involved with education in general. By participating in education-rCBLEted events, you’ll increase your overall visibility and recognition among educators, students and parents. In addition to these suggestions, think of ways that you can encourage students you interact with to check out your Career Cruising profile and save your company to their portfolio. If you send a targeted message, ask students who receive it to save your company’s profile to their portfolio. If you have an interaction with a student at career fair, ask them to save your company to their portfolio. Inspire offers some powerful ways to connect with your future workforce. Put them to work for your company! By increasing your visibility to students and educators you will raise your company’s and industry’s overall profile in the eyes of the future talent pipeline within the Greater Madison Region and beyond. How Popular is Your Business with the Future Workforce? One of the great things about Inspire for our business partners, is that you can keep track of how many students have saved your company to their portfolios in their career exploration and planning activities. See below for how many students have saved your company. The list is from most saves to least. If your business isn’t on the list, it means that you have no student saves. Click here for information on how to improve your visibility to students. Make Sure You’ve Joined At Least One Career Coach Message Board! Many of our business partners have full access to participate as a career coach yet they haven’t actually joined any message boards. For example, half of the 485 registered coaches that work in the seven primary Inspire Madison Region counties haven’t selected any message boards yet. We encourage you to log-in to your account if you are unsure of your message board status and select any careers for which you can answer questions. You do this by clicking on “Update Your Profile” then finding where it says “Edit Career List” on the right side of the page and selecting careers. Please make sure that you have at least one career selected because it will greatly improve the chances that you’ll have an impact on the future workforce through Inspire. Erik Nielsen: EatStreet director of engineering, career coach master and computer programming ninja talks about his career path and gives some great advice to students on how to get into programming. Q. Why did you get involved with computer programming? How old were you when you started? A. I was in 4th grade when I wrote my first program in BASIC on an Apple IIe computer in my math class. My father worked on some early computer systems (before computer science was even a degree you could get) and was at that time in the tech industry. So we also had computers in the house, and I would play games and use other software but also boot the computer into BASIC mode to play around. In high school, I joined a Boy Scout Explorer post (co-ed) at AT&T Bell Labs (now Lucent). There I learned basic UNIX and Linux skills. My high school also had a program where, if they didn’t offer an AP course that you wanted to take, you could enroll at Ohio State University (now “The” Ohio State University — I feel old). In my senior year, I took basic computer science courses like intro to programming courses and assembly language programming (of course, this was in languages like Pascal and Modulo-2 that no one uses anymore). Q. What steps did you take to make this your career? A. I knew I was going to go into some form of computer programming when starting college, but I always tried to get a job in some form of IT. Near the end of high school, I started looking for tech jobs for the summer. I was lucky to get a summer job after high school and before college at Progressive Systems, a company that made PPP communication software. These days, no one knows what PPP is, and Progressive Systems has long been acquired and merged with another company. If I really think about steps, it’s using connections or whatever resources you have to find the first job, and then looking for the next opportunities that are going to advance your career. However, there I got to learn a lot more about different flavors of UNIX systems and do some basic web programming. When I started college, I got another system admin job maintaining computers for the Computer Sciences department. I did an programming internship at SCO in Santa Cruz after my Freshman year. (That’s another company that doesn’t exist anymore… is it me?) After that, I looked for another programming job back in Madison, and I found one at the UW-Chemistry Department at the Smith Group. At this point, I fell into biotechnology working control software for a genetic sequencer and various bioinformatics tools, and that set me off into my initial career doing software development and IT for biotech companies. If I really think about steps, it’s using connections or whatever resources you have to find the first job, and then looking for the next opportunities that are going to advance your career. All the while, you need to keep up with technology trends and update. You’ll note that I no longer program in BASIC or Pascal, nor do I use PPP with a modem to connect to the internet. Ironically, though, UNIX skills from systems developed in the 1970s are still relevant to my job today. Q. Where did you get your degree? A. I graduated with a Computer Sciences degree from the UW-Madison. Note that the “s” in Sciences is not a typo. I think it reflects the Computer Sciences departments acknowledgement that there are many fields under the department including Data Science, Software Engineering, Computer Architecture, Operating Systems, Databases, Mobile Devices, etc. Q. When do you think an aspiring programmer should get started learning to code? A. As early as they can follow a recipe. Or, better yet, as early as they can instruct someone else in following a recipe and correct them when they go wrong. Q. What are some ways that a young person can get started on computer programming early? A. LightBot and other apps are great to start thinking in the way programmers think. I had the advantage of taking programming in my early math classes, so that’s something that school curricula can provide. Also Google “programming resources for kids”. The real answer, though is to start doing things, then do the next thing, and, before you know it, you’re a programmer. If you don’t have a computer, try to get one cheap off of craigslist. If it’s a PC, install Linux. If you’re interested in app development, the tools are mainly free to download. If you have computer course at your school, take it. Learn to touch type if you haven’t already. Learn Linux commands (macOS is also based on UNIX, so there are cross-over skills there). Find a makerspace. If there’s a career exploration group like Boy Scout Explorer post in a career you’re interested in, join it. If you don’t have an internet connection at home, go to your local library. Q. Are there other important subjects or skills a young person should learn to help them if they want to be a programmer? What are they? A. Math and logic are very important, as are critical thinking skills. Soft skills are an increasing differentiator for employers, so good written and verbal communication skills (ala English and speech classes) are great complementary skills. Graphic arts and design are also important for visual communication and user experience. Though, if you believe Larry Wall, one of the luminaries of computer programming, the virtues of a great programmer are Laziness, Impatience, and Hubris (http://threevirtues.com/). (For hubris, pay attention when you study MacBeth in English class… that’s the only reason I know what hubris means without having to look it up). For reference, I took AP Language and AP Literature in high school, and, even though I had to read Tess of the D’urbervilles, I don’t hold a grudge (or at least not too big of a grudge) against my English teachers. Doing a lot of reading and writing is very, very important to modern software development, where technology changes quickly and you are always reading and parsing documentation and writing code and documentation for other people. Thank your English teacher even if they say alright is “all wrong”. It’s at least nice to know the rules before you break them. And Google Docs didn’t underline “alright” in red, and neither does Microsoft Word. So there. I’m not bitter. Q. What do you like most about your career as a programmer? What don’t you like? A. Another way of saying impatience is being quick to get bored. I get bored very easily, so I need a constant stream of new challenges. Programming can provide that, because there’s always a new problem to solve, a new feature to implement, or a new bug to fix. The problems also vary in scale. Once you have something working for yourself, how do you make it work for 100 people? a thousand? a million? How do you fix it when it breaks? One trend in computer programming is DevOps, which is a combination of development and operations. Modern websites need to be up and operational 24/7/365. That means that developers have to be available 24/7/365. On the one hand, this gives developers an incentive to write good code that’s not going to break at 2am. On the other hand, someone has to be on call at 2am when the code breaks, the site’s down, and the office is on fire. I’ve had my share of 2am calls. However, that’s the price you pay for working in a very fast paced environment. And not all software development jobs are like that. Even most might not be like that. I think people can find the programming job for the level of excitement they’re prepared to deal with. The fun part is that that there are all kinds of programming jobs from manufacturing, automotive, aerospace, biotech, robotics, artificial intelligence, apps, web, whatever. You can apply computer programming skills to many, many jobs, even if your primary job isn’t computer programming. Even the marketing people need to know SQL for data access and analysis. Founded in 2010, EatStreet is one of the largest independent online and mobile food ordering and delivery services in the U.S., based in Madison, Wisconsin. Today, EatStreet serves over 250 cities, connecting customers to more than 15,000 restaurants. To hungry diners across the country, EatStreet is the smartest shortcut from hungry to happy. Inspire Madison Region brings together businesses, schools, community organizations and volunteers to create a vibrant workforce in the Greater Madison Region. Communities in Dane, Columbia, Dodge, Green, Iowa, Jefferson and Sauk Counties have the opportunity to build bridges between employers and secondary and post-secondary schools across the … Join Now and Get Involved!